With the elimination of Brandon Adams on Day 2 in the 2018 Poker Masters $100,000 Main Event, the distinction of who would win the player of the series and the Poker Masters Purple Jacket was no longer a mystery. That honor belongs to 24-year old Ali Imsirovic. But while the Purple Jacket was already being tailored for Imsirovic, there was still the matter of who would take home the $1,150,000 first place prize in final event. 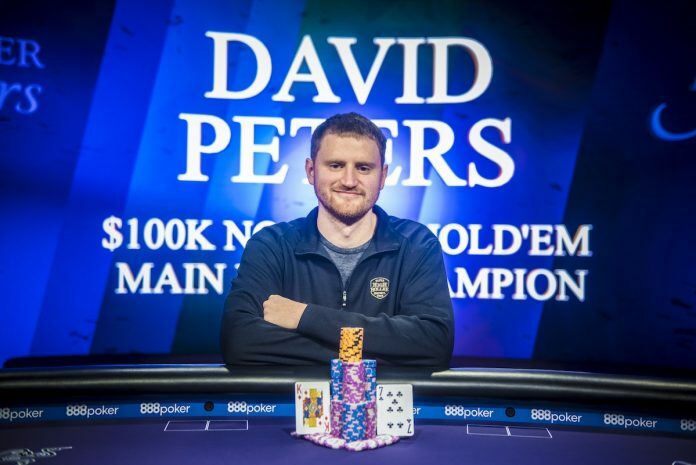 As it turned out, the 2018 Poker Masters finished much in the way it started: Event #1 champion David Peters adding another victory, and million dollar payday, to his resume. At the start of the final day of play only four players remained, all well-known for their prowess at the high roller level. Peters, who held the chip lead and 220 big blinds. Dan Smith who was right on Peters heels. Germany’s Koray Aldemir sitting third in place and Bryn Kenney, with 23 big blinds looking to find some double ups in order to get back into contention. A little over an hour into play, Kenney found a hand to make a move. With roughly 10 big blinds Kenney shoves on the button with only to be called from the small blind by Aldemir and his . The flop came and Kenney needed some help on the turn. It came which didn’t open the door to any more outs. Kenney would need one of the remaining three tens. The completed the board, ending Kenney’s tournament. Kenney, who had recently remarked on the Poker Central podcast that he was down seven-figures in 2018, picked up $250,000 for fourth place. After the elimination of Kenney, play wore on for hours. The three players took turns making big hands and bigger calls. Aldemir, who was the short stack for most of three-handed play, evened out the stack and even took the chip lead at one point. But a crucial hand in which Peter shoved with and was called by Aldemir holding proved to be a tipping point. Peters hit running cards to back into a straight. Aldemir who had worked so hard to climb back into the tournament was once again crippled. In the end, Aldemir couldn’t rebuild. He eventually busted on a hand where he shoved from the button with and ran into Smith’s . The board ran out and despite his best efforts, Aldemir finishes the Main Event in third place for $400,000 leaving him under $35,000 to hit $10 million in lifetime live tournament earnings. Smith and Peters opted to decrease the time of the levels to 15 minutes and got to the work of determining who would win the $1.15 million. Smith started heads-up play with the slightest of chip advantages. But once Peters took the lead in the first few hands, he wouldn’t give it up. Finally, on the 198th hand of final table play, Peters sealed the deal. Applying pressure, Peters shoved the button with and was called by Smith’s . Peters was dominated but it was Smith’s tournament that was at risk. The flop looked clean for Smith as it came . But when the turn came , Peters was looking to hold. The river card was the ending Dan Smith’s Main Event run in second place for $700,000. And also wrapping up the 2018 Poker Masters. David Peters, secured his second victory of the series for $1,150,000. What a difference a cash makes. With his victory in the $100,000 Main Event, Peters was only 10 points shy of Imsirovic on the 2018 Poker Master leaderboard. Though both Peters and Imsirovic each had two victories during the series, Imsirovic also scored an eighth-place finish in Event #1 for $27,600. That ended up being the cash that made the difference for the Purple Jacket.